Here is the latest installation of bi-weekly brief reflections on the Heidelberg Catechism. As a way to mark the 450th anniversary the publication of one of the most significant documents in the Reformed tradition, I’m offering these thoughts. (For some background and the entire document, check this out). A. That throughout his life on earth, but especially at the end of it, he bore in body and soul the wrath of God against the sin of the whole human race, so that by his suffering, as the only expiatory sacrifice, he might redeem our body and soul from everlasting damnation, and might obtain for us God’s grace, righteousness, and eternal life. Q. 39. Is there something more in his having been crucified than if he had died some other death? A. Yes, for by this I am assured that he took upon himself the curse which lay upon me, because the death of the cross was cursed by God. Q. 42. Since, then, Christ died for us, why must we also die? Q. 44. Why is there added: “He descended into hell”? Without a doubt, the thing I am asked most frequently about in the Apostles’ Creed is the phrase, “he descended into hell”. Why is that there? What does it mean? I’ll come back to that in a minute, but first, let’s consider the rest of this series of questions and answers from the Creed that deal with the suffering, death, and burial of Jesus Christ. Despite its brevity, this is once again an example of rich and deep exposition that is full of solid biblical truth and warm pastoral comfort–two traits for which the entire Catechism is famous. We are reminded that Jesus Christ’s suffering and death was “once for all, the righteous for the unrighteous, to bring you to God” (1 Peter 3:18). Like the very first question of the Catechism states, it is here that we find our “only comfort in life and death”. It is not just the fact that Jesus Christ died, however, but how he died that matters. Yes, the punishment for transgressing God’s holy Law is death, but as we are told in Galatians 3:13: “Christ redeemed us from the curse of the law by becoming a curse for us, for it is written, ‘Cursed is everyone who is hung on a tree’ [Deuteronomy 21:23]”. It is not just death, but death on a cross that fulfills and removes the curse of the Law that rests upon the lawless. It is not just death on a cross, but the death of the Son of God on a cross that is of sufficient worth to atone for the sins of God’s people. C.S. Lewis is said to have remarked that the hardest part of the Apostles’ Creed to believe is the phrase “under Pontius Pilate” because it takes what might otherwise be an ethereal and abstract mythology and lodges it firmly in history. The gospel is wed to actual historical events and is never to be seen as disembodied ideas or theological concepts that are not tethered to real places, people, and events. Christ’s suffering and death at the hands of an “earthly judge” was real and was for us, in our place. Why was he buried? Because he was dead. Next question. Except even this is significant because from the earliest days it was claimed that Jesus didn’t really die, he just fainted or slipped into a brief coma. Being buried in a sealed stone tomb for more than two days is the easiest way to refute this false accusation. If Jesus Christ conquered death through his death, then why do we still die? This is–in my opinion–one of the most heart-warming and comforting phrases in the document. For those who are united to Jesus Christ by grace through faith, our death is no longer to be seen as punishment for our sin (because Christ removed that punishment) but as the necessary means by which we enter into eternal life and forever die to sin. This is a wonderful way to refocus us and redefine what death truly is for those who belong to Christ. 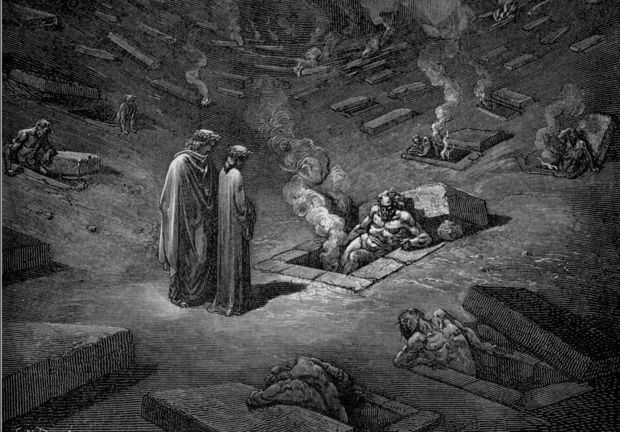 Finally, the catechism turns to the question everyone always asks: why the mention of hell? Because this phrase and a few others were not part of the oldest received versions of the Creed, many traditions omit it. The breadth and scope of its historical inclusion–as well as the reasons behind it–seem to me to be legitimate recourse for having it there, however. Some understand it to mean a real “descent” of Jesus Christ into hell after his death but before his resurrection. This is usually supported by 1 Peter 3:19, though most interpreters do not see that as the best understanding of those verses. Furthermore, it conflicts with Jesus own statements, “It is finished” and, “I tell you the truth, today you will be with me in paradise” (John 20:30; Luke 23:43). Scripture does not directly teach of, nor indirectly allow for, a “spiritual descent” of Jesus Christ into hell during the time in which his body lay in the tomb. The Catechism’s answer is a distillation of Calvin’s teaching on this (see his Institutes II.xvi.8-12). It holds that these phrases are not meant to be read sequentially (suffering–>death–>burial–>hell), but that the phrase “descended into hell” is really a summary and encapsulation of all that Christ went through when he took up our sins. Calvin writes, “…he suffered the death that God in his wrath had inflicted upon the wicked”, “…unless his soul shared in the punishment, he would have been the Redeemer of bodies alone”, and “Christ had a harsher and more difficult struggle than with common death”. The Catechism points out that this experience of “hell” (i.e. suffering for sin and experiencing judgment) is something that Christ experienced even before the cross–referring to his torment and agony n the Garden–but especially on it. So, why the phrase about hell? To confirm and intensify everything that came before. Jesus’ suffering, judgment, death, and burial reveal to us that he experienced the full wrath of God in our place for our sins. He bore the wrath of God and became a curse for us. He “descended into hell”. And because he did, we will never have to, provided we cling to him in faith and rest in his finished work. ← Book review: AND THEN THE END WILL COME!